Avengers: Endgame new TV spot is here and it is sure to blow your mind. After the makers released new footage from the film yesterday, which showed us Rocket Raccoon poking fun at some of the Earth's mightiest superheroes, the new one here is all set to make you nostalgic when it comes to the journey of Marvel films, right back from the first Iron Man, which premiered way back in 2008. It has been a decade with the release of 21 films and all of those get a glimpse in the new TV spot titled, 'To the End'. In the footage, the film's are shown according to their release. It is simply amazing to watch the journey of these superheroes over the years. Finally, the video concludes with a bit of new footage from Endgame, which features the Avengers in their new team suits gearing up for their final mission. 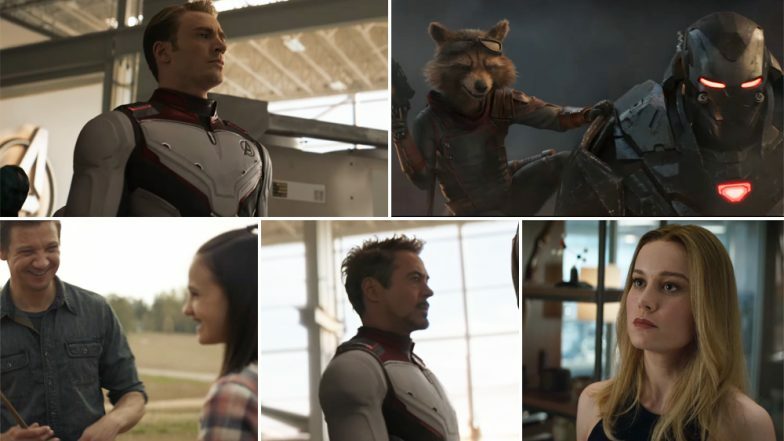 Even though we have heard from the reactions that the 20-minute footage shown at Seoul that the film is going to be an emotional ride, this TV spot involving the history of all our favorite Marvel films is enough to give you a glimpse of it. Box Office: Avengers Endgame Breaks Pre-Sales Record in China; Zooms past Infinity War and The Fate of the Furious. Directed by Anthony and Joe Russo, Avengers: Endgame starring Robert Downey Jr., Chris Evans, Mark Ruffalo, Chris Hemsworth, Scarlett Johansson, Jeremy Renner, Don Cheadle, Paul Rudd, Brie Larson, and Josh Brolin, the film is all set to release on April 26.